A spacious, bright house with large kitchen and cozy courtyard. 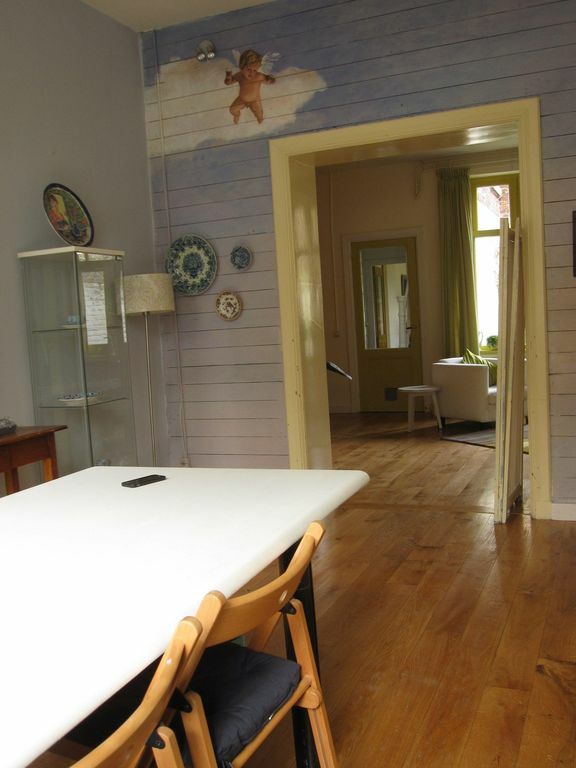 Not far from the old wall of Maastricht is my fun, special house, with lots of color and art (I'm painter) is dressed. In the anteroom you look at the park across the street, into the back room to the courtyard. Then there is a hall where the toilet is and the stairs. Here are also the washer and dryer. Then you come into the spacious kitchen with six-burner stove and dishwasher, which overlooks the courtyard. On the first floor is a spacious bathroom (shower 120x90) with WC and three bedrooms. One bedroom has a double bed (160 x 2) and wardrobe. The other bedroom has a bunk bed and two single beds that can be joined to a double bed of 180x200. The third bedroom is behind the second in my former studio and has two beds: 180 x2. 00 and 1. 40 x 2. 00. Spacious bathroom with (walk-in) shower of 120 x 90. Washbasin and WC. The house is definitely not your average house. If you are sensitive to decorative details such as antique tiles, hand painted cabinets and pottery, paintings and color then you can indulge in the welcoming atmosphere of this house. We enjoyed our stay very much, the house is lovely and very spacious, close to the city center, and has wonderful views on a green area of the city. The house has everything you need to feel at home. We really appreciated the wonderful art by the owner displayed in several rooms. It is also convenient that you can park in front of the house and a large supermarket is nearby. Ideal location, wonderful, spacious house. Really homely and comfortable. The owner is so down to earth, charming and friendly and very helpful. It was an excellent place to spend a long weekend in Maastricht. We hope to return next year. We loved our stay in Piekel's comfortable house. Lots of room for the 3 of us. We were able to cook for ourselves, which we appreciated. This place is amazing! Perfectly located and so much wonderful space! Felt like home! Our visit to Maastricht was great! We had a wonderful place to stay with so many great amenities and Piekel was always available whenever we need something. There was so much space and everything was so cozy! It felt like being home! A warm and friendly welcome, a gorgeous home, a wonderful stay. Das waren sehr schöne Tage in einer wunderschönen Wohnung! Eine sehr schöne geschmackvolle Wohnung! Maastricht is a wonderful city, full of restaurants, quaint streets and atmosphere.